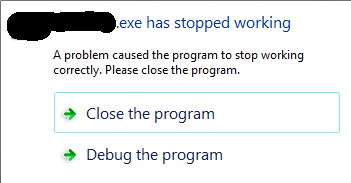 Windows 7 pro displays a dialogue that hangs a crashing process, preventing it from closing. I need windows to just let the process die. I would prefer to make this rule specific to one the executable, but disabling this behavior system-wide would be acceptable. I have a server-side application that is, shall we say, particular about its execution environment. It only runs on windows 7 pro. So I give it a tiny VM and all is good, for a while. However, when the process crashes, windows stalls the process and displays a dialogue saying the process has crashed with a few options. The loop does not, well, loop until someone clicks "close the program" (or anything else for that matter). I want windows to get it's user-friendliness out of the way so the batch file can do its job. I would prefer the rule applies just to the one exe or things run from the batch file, but disabling it system-wide would also be acceptable. This process is legacy code that we will be replacing soon (with unix version), but we need it to run consistently on the VM for now. As one would expect, everything I can find on the net is about attaching a debugger or finding a dump file. Browse other questions tagged windows-7 windows batch crash or ask your own question. IIS worker process crashing without stack trace - what else can I try? How to run a process in the background without keeping a batch file open? Just-In-Time Debugger: Unhandled exception - how do I get rid of the error message? FileMaker Pro 13 Advanced and Windows Server 2008 R2?